Israeli PM Netanyahu is harvesting a storm of indignation by positing in a speech that not the Nazis but the Grand Mufti of Jerusalem is the source of the Final Solution, the genocide of the Jews in World War II. But his goal was to make a broader point. 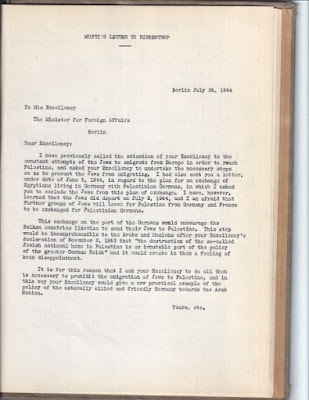 Letter from the Grand Mufti to Ribbentrop, urging that Jews not be deported to Palestine. UPDATE: After checking the historical records, turns out PM Netanyahu was absolutely right. But his actual goal was to make a broader point: that Islamic Jew hatred predates the Jewish state and even so called "occupation"
Mr. Netanyahu, who had also called the mufti “one of the leading architects of the Final Solution” in a 2012 speech, on Wednesday called the criticism of his remarks “absurd.” “My intention was not to absolve Hitler of his responsibility,” he said as he left Israel for Germany, where he met with Chancellor Angela Merkel. Netanyahu was blasted today for blaming the Holocaust on the Grand Mufti of Jerusalem. He made the remarks Tuesday evening during a speech to the 37th World Zionist Congress in which he blamed Al Husseini for spearheading Hitler's final solution, sparking a firestorm from critics. They have refuted Netanyahu's claim with the argument that "the Holocaust had already started" before Al Husseini's meeting with Adolf Hitler in 1941. (Source) But Netanyahu's claim is supported by the late Dutch Arabist, Hans Jansen (Wiki), who was also an expert witness for Geert Wilders in his first trial (the second is under way). Here's a short translation of the major points. Friday afternoon, November 2, 1941, 4 PM: a meeting takes place in Berlin of the German leader, Adolf Hitler with the Grand Mufti of Jerusalem, Amin el-Husseini (1897-1974). The Mufti describes the meeting in his memoirs, published in Damascus in 1999. 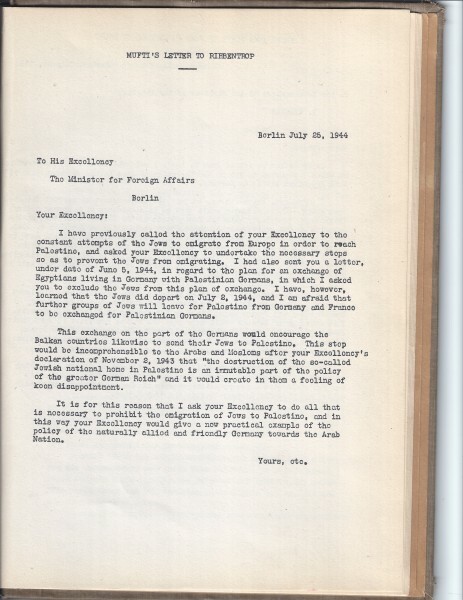 According to the official German declaration after the meeting, the war against the Jews meant a Jewish national homeland in Palestine would hence be opposed. After the meeting Hitler ordered Reinhard Heydrich to assemble a task force to prepare for the final solution of the "Jewish problem". The next day Heydrich invited 13 prominent Nazis to attend a meeting on December 9 at Wannsee, a suburb of Berlin. Due to the Japanese attack on Pearl Harbor the meeting at Wannsee did not take place before January 20, 1942. The purpose was to coordinate the efforts of the various German Ministries and institutions towards the destruction of the Jews. Between 1933 and 1941 the Nazi regime had allowed half a million Jews to leave the country. Germany had profited financially from this arrangement by collecting ransom and the confiscation of the possessions of Jewish emigrants. The Nazis were uninterested to what country the Jews emigrated. Many went to Palestine. This policy stopped in 1941. The Grand Mufti liked to create the impression he was speaking on behalf of Islam, the Arabs, even the Muslims of Asia. He successfully convinced the Germans that an alliance with millions of his followers, was a great idea. In February 1941 Hitler had received a proposal of cooperation from Al Husseini. In article 7 of the proposal he stipulated that Jewish emigration from Europe would have to stop. On March 11 Hitler agreed to the proposal. As per October 31 all emigration of Jews from German territories was halted. That of course demanded another final solution. As we now know, one was found. It is unlikely that a tribunal would have found Al Husseini guilty; not because of fear for his followers, but because the Nazis probably would have found a solution anyway. In any case, Al Husseini wasn't on trial at Nurnberg, perhaps because he was also on French and British payrolls as a 'secret agent'. France and Great Britain would have have been caught with egg on their face at a time this still mattered. In 1937 the Mufti made an appeal to the Islamic world. The text had already been translated into German in 1938. The appeal contains the exact same talking points as made today by Hamas, Hezbollah, Iran's Ayatollahs, the Muslim Brotherhood, Al Qaeda and the Sharia4 movements. It goes without saying that a world free of Jews is an important theme that is developed at length in traditional Islamic texts. How is it possible that other Islamic leaders haven't challenged Al Husseini's authority? First of all, the other leaders were mere representatives of influential families, clans, tribes or some other local ruling group. They had no international appeal. By taking the maximum radical stance and smearing every moderate player as a traitor, Al Husseini and his spawn managed to monopolize representation. Even to this day moderate Muslims dare not speak for fear of activists and fanatics who appeal to Scripture, the Koran and Sharia directories. This is not just dangerous, but it makes it very hard to invalidate their legitimacy. Hans Jansen refers skeptics to the book "Nazis, Islamists, and the Making of the Modern Middle East" (2014) written by Barry Rubin and Wolfgang G. Schwanitz.